In Schrödinger's famous thought experiment, a cat seems to be both dead and alive—an idea that strains credulity. These days, cats still don't act this way, but physicists now regularly create analogues of Schrödinger's cat in the lab by smearing the microscopic quantum world over macroscopic distances. With these goals in mind, some researchers are eager to create better cat states with single ions. But, so far, standard techniques have imposed limits on how far their quantum nature could spread. 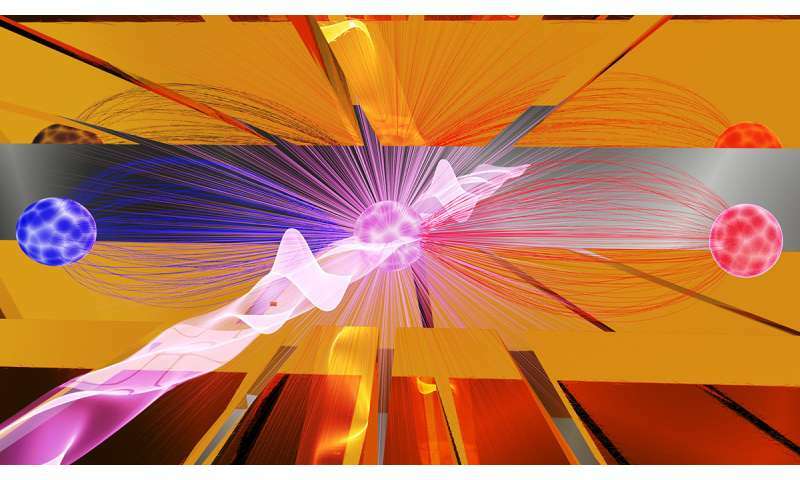 Recently, researchers at the Joint Quantum Institute developed a new scheme for creating single-ion cat states, detailing the results this week in Nature Communications. Their experiment places a single ytterbium ion into a superposition—a quantum combination—of two different states. Initially, these states move together in their common environment, sharing the same motion. But a series of carefully timed and ultrafast laser pulses apply different forces to the two ion states, pushing them in opposite directions. The original superposition persists, but the states end up oscillating out of phase with each other. Using this technique, the JQI team managed to separate the states by a distance of almost 300 nanometers, roughly twelve times further than previously possible. There's still just one ion, but its quantum nature now extends over a distance more than a thousand times larger than its original size. Such long-range superpositions are highly sensitive, and could enable precise atom interferometry measurements or robust quantum cryptographic techniques. What about Schrödinger's cat being neither alive nor dead? If we are taking the reliance on observation/measurement to be the nexus of the scientific principle, then who observed the cat both live and both die? From the frame of reference of a human or apparatus, as quantum systems, they have no observation of the quantum system that is 'anything inside the box'. Any observer inside the closed system has access to observation, so to them, the cat is either alive or dead. If you define a border through which no observational information passes (for some length of time), then other than the original information of what objects were where when the box was closed, an external observer has no additional information about what is inside the border. QM is fun though - seems that however people conceived of magic millennia ago, QM-tech will get pretty close! Schrödinger's cat. Schrödinger made this analogy on a conference, to show how ridiculous other physicists idea was. They said: this is exactly what we mean. Hence and since the Schrödinger's cat. Are the dots just as ridiculous? Or not? Or neither and both in superposition? The logic of quantum reality has different characteristics than the logic of classical logic, which is the logic you experience every day. Schrödinger's Cat is an analogy. This experiment is what it is an analogy of: an ion that is both here and there at the same time. Worth mentioning here that this is by no means the first experiment to have produced such states; what's novel is how far they separated them for this particular type of experiment. @nikola, physicists understand that death and life are different states. You have missed the point of the cat analogy. Physicists don't deal with biology. They are simply making an analogy, not making statements about death and life. I have no idea what you're talking about, @nikola. Multiple experiments, performed in completely different ways, have found these states exist. This is experimental data. If that's not science, I don't know what to call it. This isn't theoretical; it's real data from real experiments. There really isn't anywhere to hide here.